MoDOT takes great pride in being a good steward of the environment. As part of Maintenance operations, we must strive to protect, conserve and enhance the environment while maintaining and operating a complex transportation infrastructure. 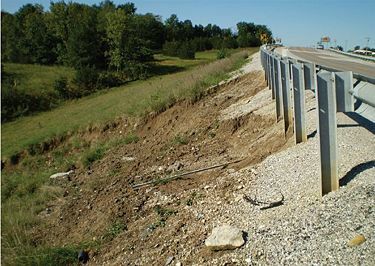 EPG 173 offers examples on how to maintain roadway slopes and ditches to prevent erosion and slides and how to repair slopes and ditches when they are impacted by slope erosion and slides. EPG 173.1 Regulations and Permits outlines the rules and regulations that set the boundaries for MoDOT’s actions. 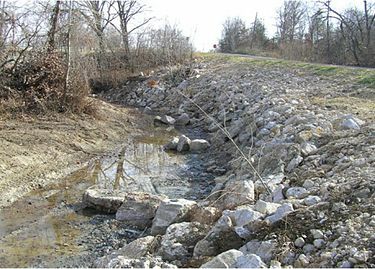 Typically, eroded ditches, slopes or stream banks have been repaired with rip-rap material to mitigate future erosion. The following articles outline specific examples on prevention and repair with step-by-step pictorial overviews. 1.1 173.1.1 Do You Need a Section 404 Permit? There are many laws in effect today that were enacted in an effort to protect the nation’s natural environment. These laws have a direct effect on the way MoDOT conducts business, as it is MoDOT’s commitment to remain environmentally responsible. One law in particular, the Clean Water Act (CWA), was enacted to protect the nation’s waters from pollutants. Sections 401, 402, and 404 of the Clean Water Act influence many of MoDOT’s day to day activities. The Department of Army Corps of Engineers (COE) administers Sections 401, 402 and 404 of the Clean Water Act. Specific COE district office location information is available. 173.1.1 Do You Need a Section 404 Permit? Clean Rock Fill. You must use only graded rock, quarry-run rock and/or clean concrete rubble for rip-rap. The material must be reasonably well graded, consisting of pieces varying in size from 20 pounds up to and including at least 150 pound pieces. Generally, the maximum weight of any piece should not be more than 500 pounds. Gravel and dirt should not exceed 15% of the total fill volume. If you use concrete rubble, you must break all large slabs to conform to the well graded requirement, and remove all exposed reinforcement rods, trash, asphalt, and other extraneous materials before you place the rubble in the waters of the United States. Size and gradation requirements can be changed provided approval is received from the Corps’ Regulatory Branch prior to placement. Ordinary High Water Mark (OHWM or OHW). The term ordinary high water mark means that line on the shore established by the fluctuations of water and indicated by physical characteristics such as a clear, natural line impressed on the bank, shelving, changes in the character of soil, destruction of terrestrial vegetation, the presence of litter and debris, or other appropriate means that consider the characteristics of the surrounding areas. 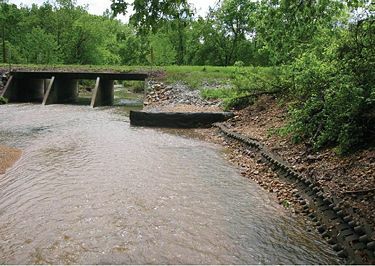 Some streams have sensitive fish, mussels, and other species in them and as a result may have date restrictions of when MoDOT can work in the stream. When in doubt, ALWAYS contact the MoDOT Design-Environmental Section at (573) 526-4778 prior to starting your activity. Hand-cutting (with a chainsaw) logs and brush that build up against our structures. Dipping out (with a trackhoe or equivalent piece of equipment) logs and brush that build up against our structures. 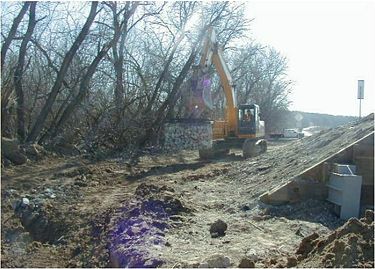 NOTE: This work must be done without entering the stream channel with a tracked vehicle (you can enter the stream with a rubber tired vehicle, as long as you ARE NOT pushing material around), either from the high bank or the bridge/roadway, and the logs/brush must be placed in an upland location, where there is not a chance of them endangering our structure again. Rubber tired vehicle in the stream channel to dip out sand/silt/gravel material. You CAN NOT push material around with a loader or skid steer; you must use a bucket to DIP MATERIAL OUT. Placing clean rock fill or shaping a streambank (laying a bank back for stability) ABOVE THE ORDINARY HIGH WATER MARK. 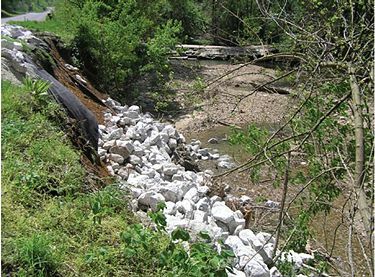 Streambank stabilization that can involve armoring a bank with clean rock fill or protecting the toe of a bank with clean rock fill. This includes stabilizing the banks behind culvert wing walls and on bridge spill fills (NOTE: This activity CAN NOT exceed 500 ft. in length and/or 1 cubic yard per running foot of fills below the ordinary high water mark (This work is covered under Nationwide Permit #13). Performing work in the channel with tracked equipment (tracked skid steer, trackhoe, etc.) to clean sediment (silt, sand, gravel, etc.) out of, or away from a structure. (Note: All material removed must be taken to and disposed of in an upland location and work CAN NOT EXCEED 200 ft. of stream length.) This work requires a Nationwide Permit #3. Performing work in the channel with a rubber tired vehicle (tired skid steer, backhoe, front-end loader etc.) and pushing the material in order to remove it. (Note: All material removed must be taken to and disposed of in an upland location and work CAN NOT EXCEED 200 ft. of stream length.) This work requires a Nationwide Permit #3. 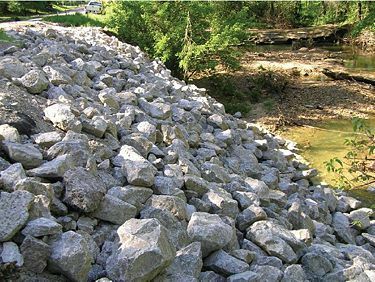 Placing clean rock fill and/or gabion baskets within the channel to stabilize culvert outlets or inlets. This work requires a Nationwide Permit #3. 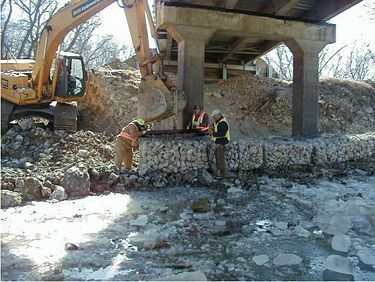 Placing clean rock fill and/or gabion baskets around scoured bridge piers. This work requires a Nationwide Permit #3. 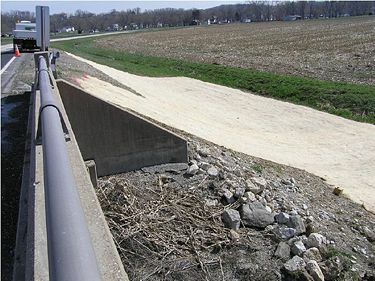 Streambank stabilization as discussed in the green section above that exceeds 500 ft. in length or 1 cubic yard per running foot of fills below the ordinary high water mark. This work requires a Nationwide Permit #13. 1. During construction, clearing of vegetation will be kept to the minimum necessary to accomplish the project. 2. Petroleum products, hazardous chemicals, hazardous wastes, equipment and solid waste will not be stored after construction working hours below the ordinary high water mark. 3. Equipment will not be operated in wetlands areas, except where permitted, expressed by the project plans or the engineer in writing. Petroleum products will not be stored in wetlands. 4. Riparian areas and streambanks will be restored to a stable condition as soon as possible after final contouring. 5. Work done in streams shall be conducted during low flows whenever that is reasonably possible. 6. Petroleum products spilled into any stream or body of water will be cleaned up immediately and the collected petroleum products shall be disposed of properly. 7. 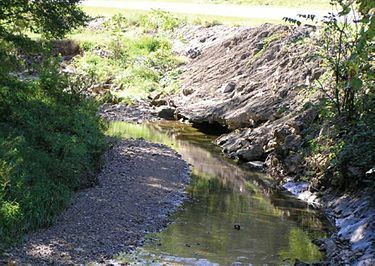 The following materials shall not be used for streambank stabilization: earthen fill, gravel, fragmented asphalt, broken concrete, including grouted rip-rap. 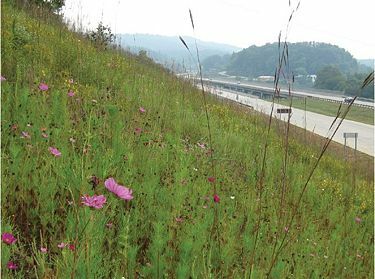 Additional information on MoDOT’s erosion and sediment control guidelines can be found at EPG 806 Pollution, Erosion and Sediment Control. CWA Section 402 (Land Disturbance). 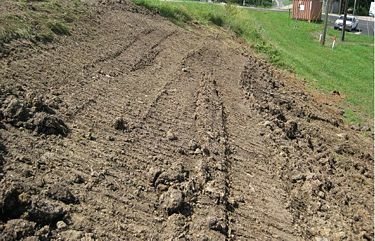 If repair of a slide involves earth moving and “damage to the root zone” of more than one acre, a DNR Land Disturbance Permit must be obtained. Existing permits for road construction will not apply in these circumstances. 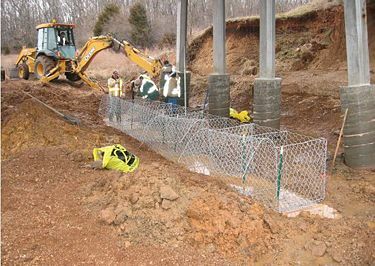 Once a permit is obtained, sediment controls such as perimeter silt fence and ditch checks will need to be installed to keep the sediment from leaving the job site while slope repair is occurring and until a final grass cover is achieved. CWA Sections 401 and 404. If the slide involves a regulated (jurisdictional) stream or wetland it may be necessary to obtain Department of Army Corps of Engineers (COE) authorization before doing work in and around the stream or wetland. Project Summary. 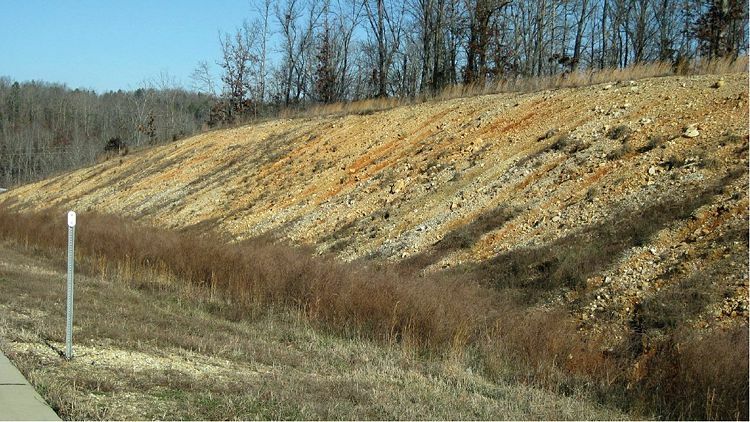 Slope failures are common problems in this area due to unseasonal amounts of rainfall and soil conditions. This area slid off near the shoulder which caused a potential hazard. A dozer was used to cut a bench into the new slope to solid ground, new fill dirt was hauled in and a slope was built back in lifts as it was compacted with a dozer. 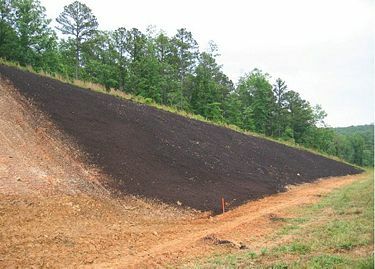 The slope was tracked and seeded with straw wattles and erosion blankets to slow down runoff and to protect the slope. 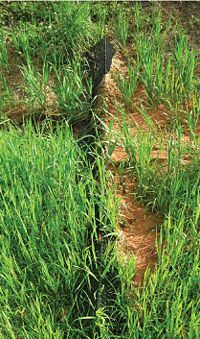 Grasses were established with no issue of erosion or settling after two years. Before photo. The slope failure near the shoulder is shown. A dozer was used to cut a bench to develop a footing for slope to be rebuilt with new material and compacted as it was filled. Shows slope after soil material was added and slope was reshaped and tracked. Final step in which the slope was reseeded, fertilized and limed and installed with 100% coconut fiber erosion blanket with straw wattles to slow runoff from shoulder. Materials Used: 4 Gabion Baskets 9’x3’x3’, 3 loads of 4-6 in. Gabion Rock for baskets, 4 loads of shot rock for slope, partial load of base rock used along shoulders edge. Project Summary. The slide was located on I-44 at the end of ramp along the edge of shoulder. At the bottom of the slope was a concrete ditch which was filled by silt that was caused by the slide. 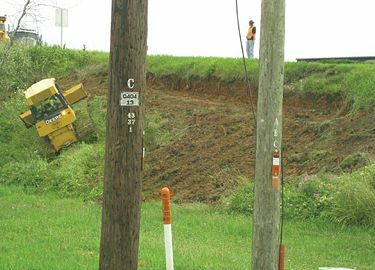 The toe of the slope was cut back from the edge of concrete ditch. 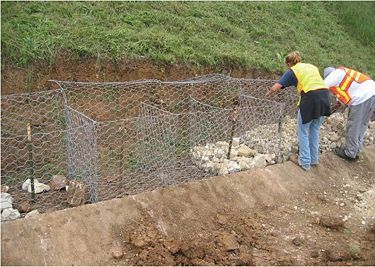 Gabion baskets were installed behind the concrete ditch and secured with T-posts to prevent the baskets from moving. The gabion baskets were filled with rock (4 in. to 6 in. without fines). Shot rock was then placed behind the gabions to the shoulder’s edge. Next to the concrete shoulder, base rock was installed over the shot rock. The project has performed well and rock has become vegetated. Before photo. Shows the slide next to the shoulder on I-44. Shows excavation for the gabion baskets to be installed behind the concrete ditch. 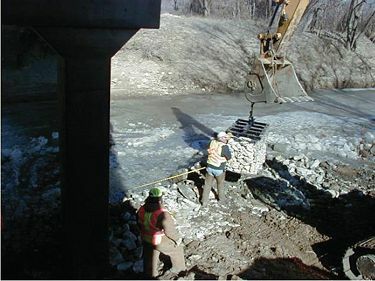 Shows the baskets in place, anchored with T-posts, and hand-placing the rock to start the filling process of the gabion baskets. Final step after the baskets were filled. Rock was placed on slope up to shoulder to fix shoulder drop off. Base rock was used to finish grade along concrete shoulder. Project Summary. This slide developed over time and was one of three in the vicinity. The work was completed by a contractor who excavated around 5000 cy (around 400 loads of material) from the site in 5 (10-12 hour) working days. It took 3 working days to place 3600 cy of rock fill (110 loads). Following the spec book, the rock was placed in layers and compacted with the track hoe. The trucks would unload the rock on the haul road, and then the contractor would push the rock into the fill site where the track hoe operator would pull the rock down so that the rock was able to be compacted and placed in layers. Another bulldozer was used at the waste site where the excavated dirt was being placed. The finished project was 300 ft. long and approximately 50 ft. tall. The slide developed over time. Repairs were completed by a contractor. The contractor used a large track hoe to rough-in a haul road into the existing slope so that trucks could drive in and out. The slope was stairstepped and benched at 1.5:1 slope. A 2’x4’ toe berm at the bottom of the slope. Rock placement began when 1/2 of the soil excavation was completed due to the risk of having so much unprotected slope along the roadway. Completed repair. A bulldozer was used to maintain the haul road. After the operations, both sites were seeded and mulched. 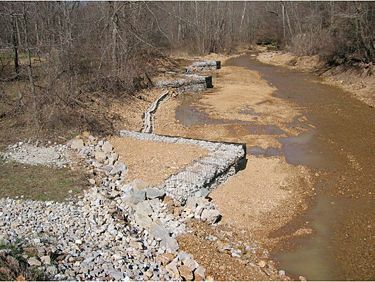 Temporary erosion control (silt fence) was used to keep silt from entering the streams. CWA Section 402 (Land Disturbance). There are no anticipated DNR issues. CWA Sections 401 and 404. There are no anticipated Corps of Engineers issues. 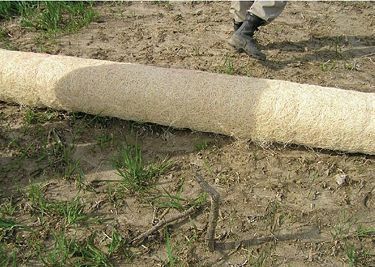 Materials Used: Approximately 150 pounds of grass mixture seed and erosion control blanket (nine 8’ rolls and four 4’ rolls). Project Summary. This repair took place on the North Fork of Cuivre River. 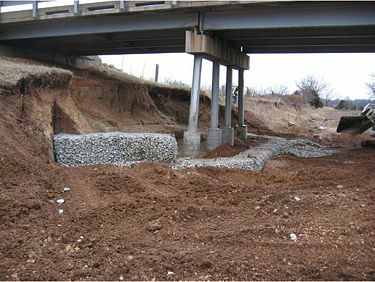 The project involved installing erosion prevention after repairs were made to scour at the bridge ends. 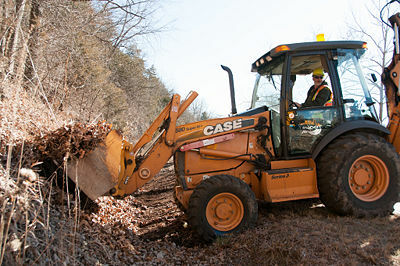 The vehicles performing the scour repairs roughed up the soil surface and eliminated the existing vegetation. An incarcerated work release crew provided the labor to install the erosion repair. Barren Slide Slope - Slope erosion prevention required after construction. Vehicles tracked over slope at Cuivre River Bridge, Route E, Lincoln County. Approximately 150 lbs. 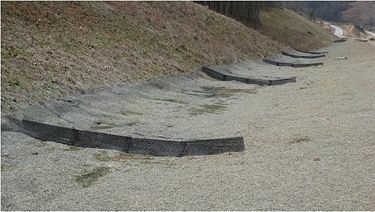 of seed, nine 8’ rolls and four 4’ rolls of Curlex II erosion control blanket were used. Blankets were pinned to the soil using sod staples. Approximate cost of materials (seed, blanket and staples) was $850.00. CWA Section 402 (Land Disturbance). Ditch cleanout is usually not an activity that involves “land disturbance” and would not require a DNR State Operating Permit. (IMPORTANT: If cleanout involves excavation of soil that is contaminated by petroleum products or other types of regulated materials a multitude of other laws may be involved. Contact the Design-Environmental Section first). 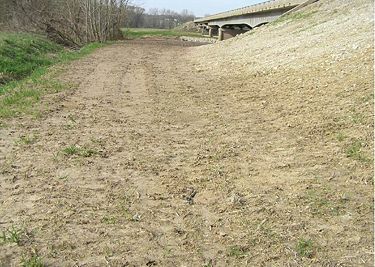 If the freshly cleaned out ditch has the potential to generate erodible slopes that could produce sediment in runoff, appropriate BMPs would include ditch checks in the road ditch at locations where runoff would be expected to enter streams or drainageways at culvert/bridge outlets or inlets. 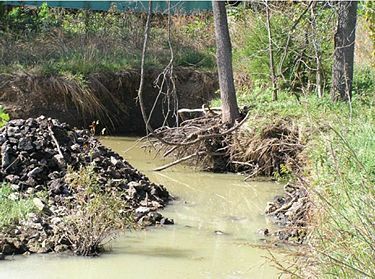 Excavated excess material must not be disposed of in wetlands or other locations where it is likely to end up in a stream or ditch. Project Summary. Purpose of the work was to test the effectiveness of the three-dimensional ridge ditch checks to triangular silt ditch checks that is traditionally used on construction projects. 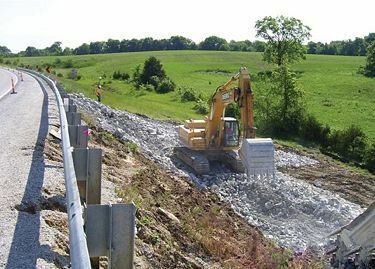 Three dimensional ridge ditch checks were installed by MoDOT crews on a 1/2 mile stretch of the Route 60 expansion construction job in Carter County. Twenty-five devices were installed over erosion blanket material with metal spikes. The devices performed well, allowed grasses through the ditch check. There were no failures after the ditch checks were removed. Three-dimensional devices can be reused if care is taken with removal. For best results, refer to manufacturer’s recommendations for placement. The grade of a ditch and the three-dimensional ditch checks that were installed. A single installation of a three-dimensional ditch check on an erosion blanket. 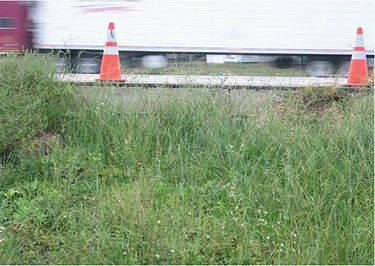 Vegetation growing through the ditch check. Sediment being retained by the ditch check. Project Summary. The former District 8 started installing large compost berms in April 2009. 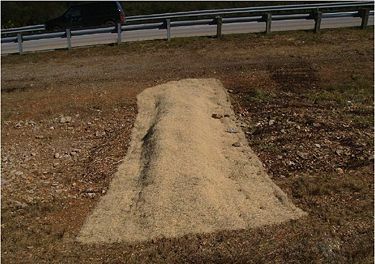 These berms consisted of about 5-6 cubic yards of half decomposed wood chips from tree trimming operations, covered with erosion control blankets. 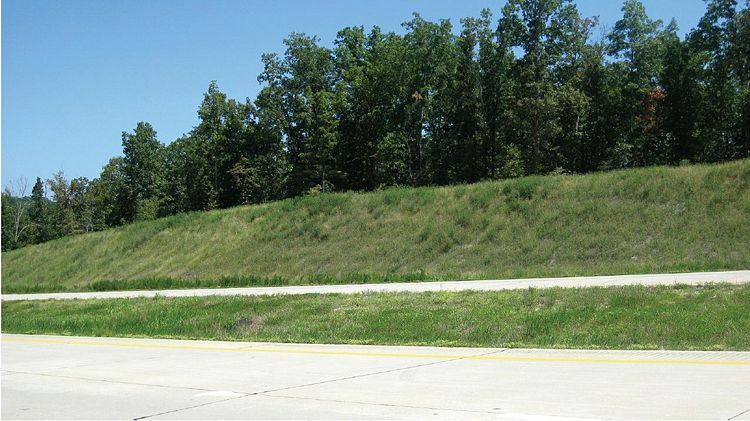 Median ditch on Route 65 prior to the installation compost berms. 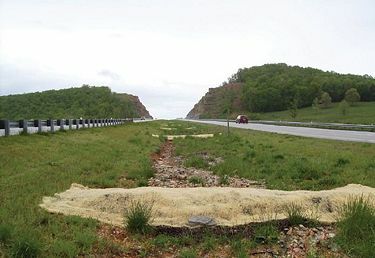 Median ditch on Route 65 after the installation of one of the compost berms. 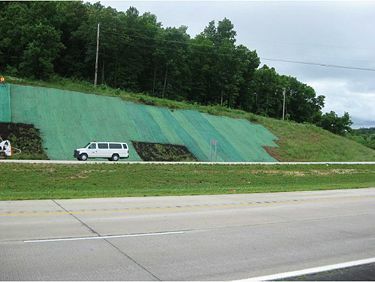 Median ditch on Route 65 with several compost berms installed. Median ditch 17 months after the installation of compost berms. CWA Section 402 (Land Disturbance). If land disturbance activities exceed one acre a separate State Operating Permit from DNR will be necessary. In that case, BMPs will be identified in the Section 402 Permit application. CWA Sections 401 and 404. 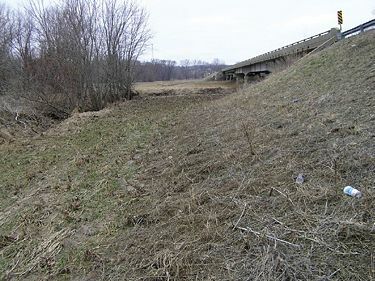 In general, streambank stabilization activities will require authorization under Section 404 of the Clean Water Act unless all work is done above the Ordinary Highwater Mark (OHWM). Project Summary. 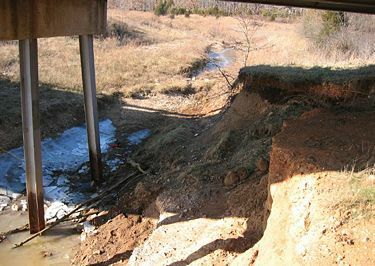 Bridge Maintenance Engineers will inspect bridges for erosion and scour, identify needed repairs, specify treatments and obtain COE permits for required work. 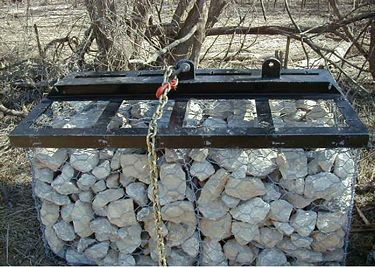 Gabion basket and lifting harness. Trackhoe transporting gabion basket to bridge pier. Gabion basket being transported to affected area. Gabion baskets being set alongside bridge pier. Project Summary. The abutment under the bridge was eroding. This caused the H piles to become exposed. The project fell under the GP-41 permit. The first step was for the district bridge crews to protect the pilings by placing concrete around them. 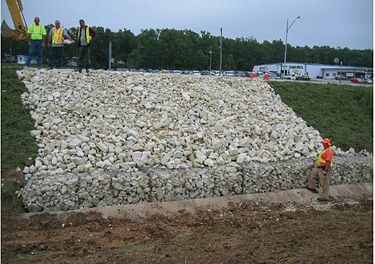 Next, the district roadside crew installed gabion baskets which act as a barrier to protect the piles and act as a retaining wall to hold shot rock on the abutment slope. Erosion of abutment slope and H piles exposed. H piles are protected by concrete collars. Gabion baskets are being installed and anchored with T-posts. Gabion baskets are being set up and filled with rock. Finished project. Rock placed on abutment slope behind gabion baskets. 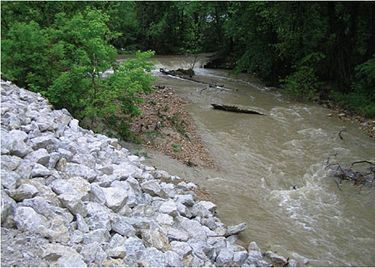 Materials Used: 4 gabion baskets filled with 40 tons of rock and approximately 300 tons of rock for streambank repair. Project Summary. The project was undertaken to repair erosion around wing walls and scour both immediately below the box outlet and downstream. 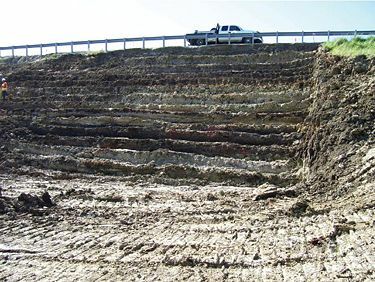 Work was performed under Section 404 Nationwide Permits #13 (streambank stabilization for erosion around wing walls) and #3 (fill placed within the stream for scour below the box). The repairs were performed by routine maintenance and the special crews. Gabion baskets were placed at the box outlet and large rocks were used downstream of the baskets and on top to help anchor them in place. The slopes around the box were seeded and protected with erosion blanket. Downstream of the box culvert the stream made a 90 degree turn and scour was occurring at the turn. A point bar had developed on the side opposite of the scour. 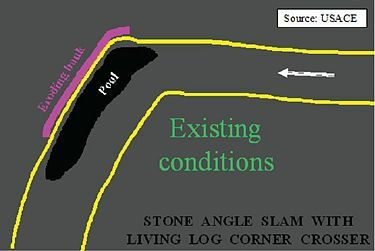 The COE suggested using a “stone angle slam with a living log crosser” to repair the erosion and protect the streambank. This work was performed under a Nationwide #13 permit. Since there was not a large log available, the crew used multiple smaller logs from willows removed from in front of an upstream box culvert. Because they were small, large stones were placed over the entire log bundle to help hold them in place. The logs will sprout and prevent further scour. Erosion around wing walls and scour below box outlet. 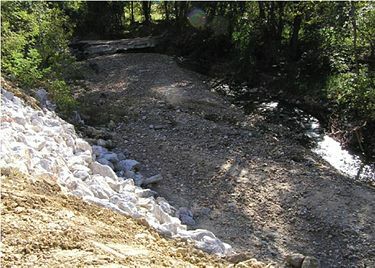 Gabion baskets, large rock and erosion blanket were placed to repair and protect the streambank. Streambank erosion downstream of box culvert. Plan view of existing conditions. Large stones (red) are first placed along the toe of the eroded slope to protect the toe. Then a living willow or cottonwood log is placed horizontally in front of the stones and keyed into the bank. 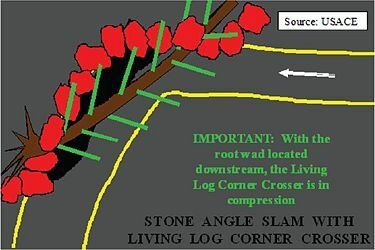 The root wad is downstream to keep the log in compression. Large stones are placed on top of the log to keep it in place and the log is allowed to sprout and root to protect stream and bank. Armored streambank with rock and multiple living logs. Materials Used: 1,200 tons of clean rock, geotextile. Project Summary. 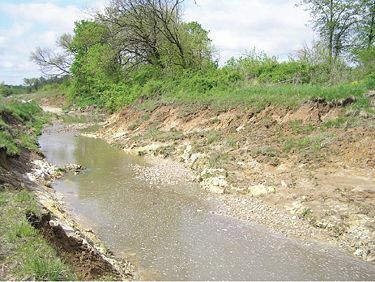 Streambank erosion was caused by migration of the main channel to the south jeopardizing the road bed. A point bar developed on the north side of the stream with many willows, cottonwoods and sycamore saplings. Repairs were performed under Section 404, Nationwide Permits #13 and #27. Work was performed by routine maintenance and special crews. Large stones were placed along the toe of the slope and keyed into the bank at both ends of the repair. A space was left behind the large stones and filled in with gravel and sediment. Living willows were removed from the point bar. 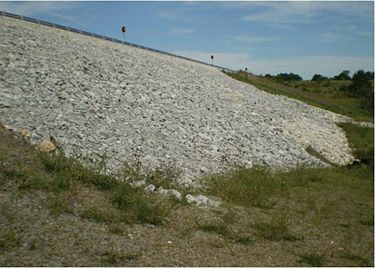 Clean rip-rap was then used to cap the removed sediment and mixed material was placed on the slope above ordinary high water to allow vegetation to develop. Large stone weirs were placed in the bed facing slightly upstream to direct the flow of water away from the toe of the slope. The willows will be allowed to sprout through the stones and further protect the streambank. The willows will be outside of the roadway clear zone. 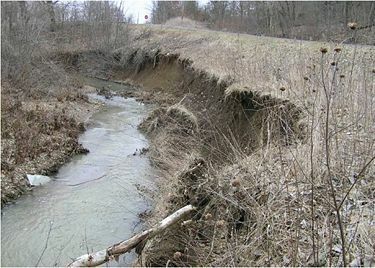 Streambank erosion caused by migration of the main channel to the south, jeopardizing a nearby road bed. Longitudinal peaked stone toe protection and large stone wiers were placed to stabilize slopes and to direct the flow of water away from the toe of the slope. Project Summary. Grouted rip-rap should not be used to repair streambanks. 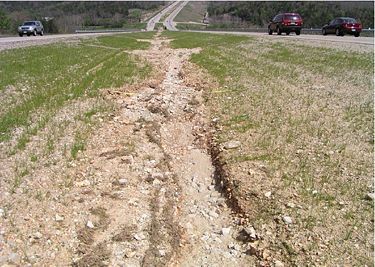 Over time, the toe of the slope will erode creating a void beneath the repair. The entire slab of grouted rip-rap may wash out during a large flood event. Furthermore, the COE does not allow grouted rip-rap as an acceptable repair option. Grouted rip-rap is not recommended for streambank repair. Materials Used: 550 tons of clean rock (400-1000 lb), geotextile. Project Summary. 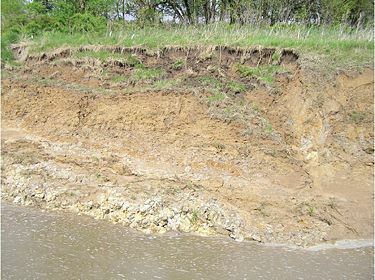 The streambank was eroding due to migration of the stream into toe of slope jeopardizing a nearby road bed. A sediment bar had developed on the opposite bank where willows were sprouting on the bar. Repairs were performed under Section 404 Nationwide Permits #13 and #27. Work was performed by routine maintenance. When the stones were dumped, the geotextile material was ripped and much of the material ended up wadded under the rip-rap. 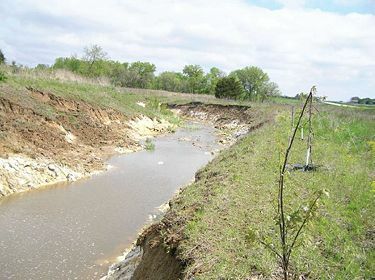 Over time, a sediment bar developed at the toe of the slope and the channel migrated to the opposite side of the stream. Willows will be allowed to sprout in the bar and along the toe of the slope to protect the bank. Streambank eroding due to migration of stream into toe of slope jeopardizing a nearby roadbed. 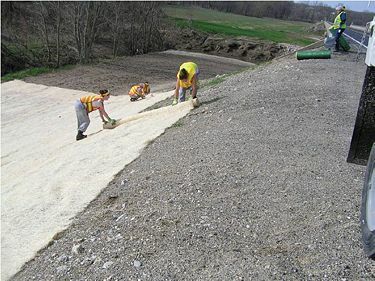 Geotextile material was placed on the exposed surface of the bank and living trees were removed from the sediment bar and placed at the toe of the slope. 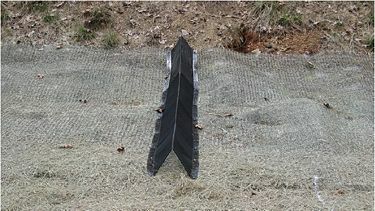 Large clean rip-rap was placed on top of the living trees at the toe of the slope to hold them in place and to protect the toe. 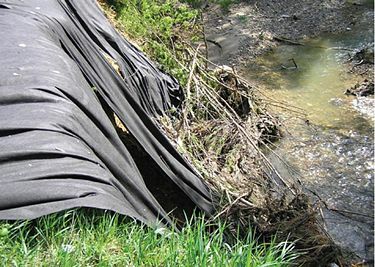 Note: Care should be taken to protect geotextile while placing rip-rap. Large rip-rap was used to complete the repairs above ordinary high water. During the next flood event, the toe of the slope was protected and the main energy of the stream was directed toward the center of the channel. 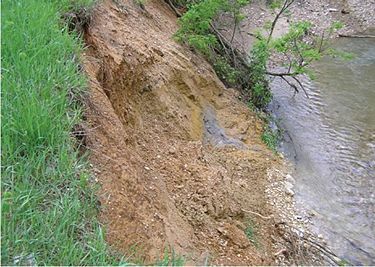 Over time, a sediment bar developed at the toe of the slope while the channel migrated to the opposite side of the stream. Project Summary. Purpose of project was to stabilize the creek bank and to correct misalignment of a culvert. 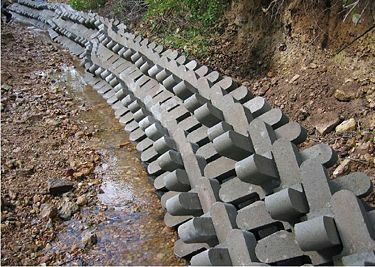 A series of concrete armour scour protection units were installed on geotextile material along the base of the creek bank with three weirs being built with gabion baskets. This project required a 404 permit from the COE. 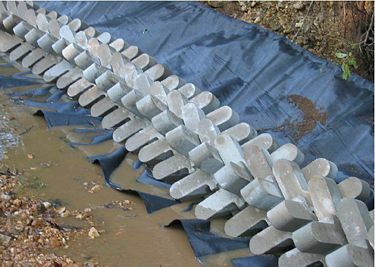 Interlocking Concrete Stabilization System being installed on geotextile blanket. A second layer of the system being installed. Shot rock placement along the culvert wingwalls. Weir construction using gabion baskets. Project Summary. The headwaters of Sees Creek was relocated due to the construction of two new lanes on Route 36. This project required an individual 404 permit. The relocation was performed by a contractor. Tree planting was performed by incarcerated personnel. 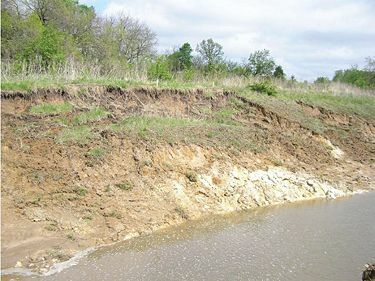 Slope erosion along the relocated streambank of Sees Creek. The streambanks were constructed with 2:1 slopes. Seed and straw mulch were blown onto the banks. 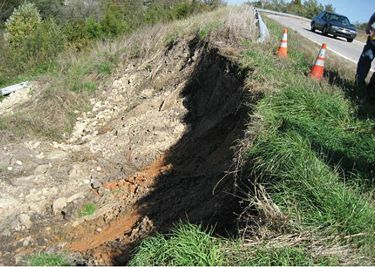 The erosion started due to steep slopes caused by a narrow right of way corridor. Relocated streams are highly volatile and thus require 4:1 backslopes that are heavily vegetated with rock at the toe of outside bends. As the slopes flatten out on their own, it will become easier to establish vegetation. 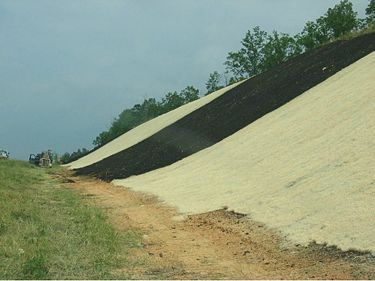 Additional seed, topsoil and erosion blankets will be added to stabilize banks. 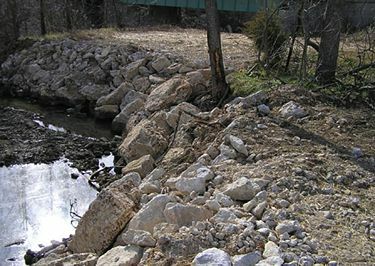 Single large stone bendway weirs and large rock will also be added to prevent further erosion. Project Summary. This seed mix has been adjusted from the MoDOT slope mix specifications and has proven to perform better on clay acidic soils in the Southest District. (Reference to the final report of the 3-year research project with NRCS). 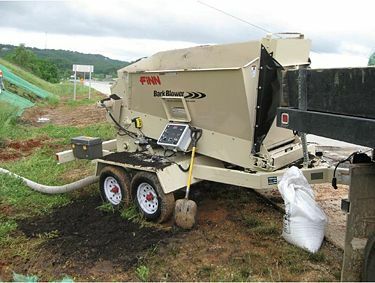 This mix is used by roadside maintenance crews when repairing eroded slopes. The soil amendments that are used include bio stimulate, liquid lime, and ag fertilizer. Bio stimulte is added to improve moisture infiltration, retention, and faster germination. Neutra Lime is a dry product which is applied during seeding to adjust soil pH which aids in the establishment of vegetation. The former District 9 experienced good results in establishing plant growth in harsh soils with this seed mix formula and soil amendments. It is recommended that soil samples are taken to determine pH levels for lime placement. 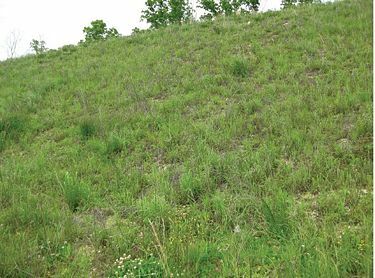 When applying lime and other amendment products on steep terrain, it is recommended that a hydroseeder be utilized. Roadside slope prior to soil amendment. 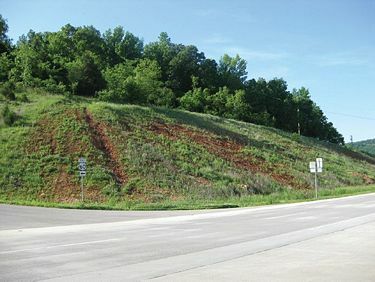 Roadside slope two months after the addition of soil amendments. Project Summary. The purpose of the project was to experiment with the use of compost. Soils in the former District 9 have a very low pH and a very low percentage of organic matter. This project tested two methods. 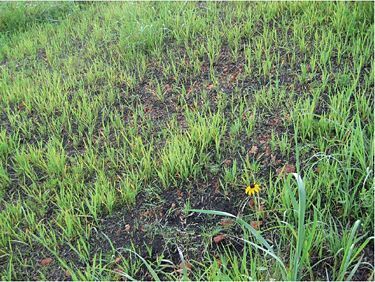 The first method applied was a one inch layer of compost that was seeded, fertilized and limed over an erosion control blanket. 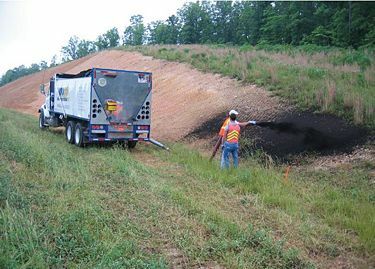 The second method tested a two-inch layer of compost without an erosion control blanket. During the first growing season there was a very light germination due to the rich and hot compost. After the second season, the slope performed well. After a thorough review it was found that the erosion blanket area functioned the best. The two-inch layer of compost did not hold up to the heavy rains that were received during the first growing season. Bark/compost blower machine used to apply compost material. Progress shown after one area had been applied. After compost was blown onto slope they were hydroseeded, fertilized and limed. The area with two inches of compost and areas with one inch of compost with erosion control blanket. As-built photo of compost project during the second growing season. Project Summary. The project was a cooperative effort between MoDOT, Big Springs RC&D, USDA-NRCS-Plant Materials Center and the Van Buren Chamber of Commerce. 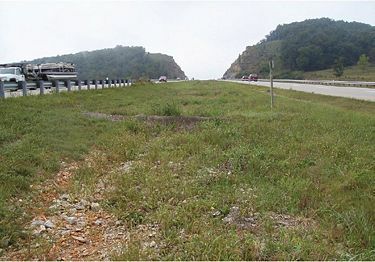 Soil erosion on the cut slopes of the right of way from a recent expansion of Highway 60 to four lanes had left the area exposed with little vegetation. The project features uses of adapted seeding mixtures, organic mulches, temporary and permanent erosion control blankets, and soil amendments for better seeding establishment and erosion control. 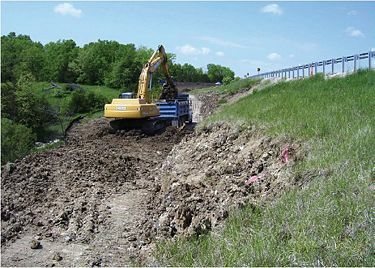 Roadside crews used a tracked dozer to repair eroded areas with top soil, areas with little or sparse vegetation a layer of ½ in. to 1 in. compost/bark mulch was applied with a rented bark blower. All areas were hydro seeded with native grass and wildflower seed mixture, in same application liquid lime and fertilizer was applied. After seeding was completed, green dyed erosion control blanket was installed. 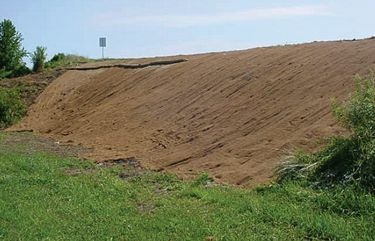 Permanent erosion blanket was used on a slope drainage ditch. Before condition on eroding roadside, Route 60, near Van Buren, Carter County. Bark Blower used to cover slope with compost. 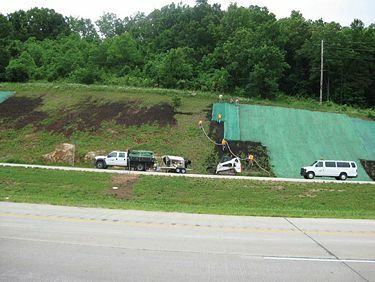 MoDOT maintenance in the former District 9 applying compost and installing a geotextile blanket on the roadside slope. Compost and blanket covering the side slope. Germination of the seed mix. Finished roadside slope with established grasses and wildflowers. If you are in a county that was declared to be a flood disaster county in 2008 and you can show that the maintenance issue is the result of flood damage, then you can use the GP-41 to do the work described below in the “Project Description”. 2008 Flood disaster maps for affected counties can be found at the Federal Emergency Management Agency website. Those activities listed in the “Project Description” do not require pre-construction notification; HOWEVER, THEY DO REQUIRE POST-CONSTRUCTION NOTIFICATION and a signed compliance certification within 60 days of completing the job. 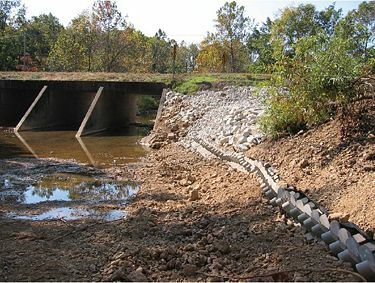 As part of the permitting process, you must contact the Corps of Engineers (COE), submit application materials and submit a mitigation plan prior to completing any flood recovery/repair activity when the repair involves obtaining borrow from forested wetland, borrowing material from potential migratory bird nesting areas, clearing trees along stream channels, working in areas with known exotic species, and/or if the proposed repair activity includes restoration of a stream channel back to the original, preflood location. 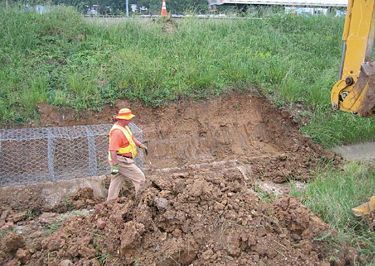 All other flood repair activities, including all repairs supervised by the Corps of Engineers, pursuant to Public Law 84-99 and/or all repairs supervised by the United States Department of Agriculture, pursuant to the Emergency Watershed Protection Program or to the Emergency Conservation Program can be completed without pre-construction notification to the Corps of Engineers. However, all completed flood repair work, authorized by this permit, must be reported to the Corps of Engineers, Regulatory Branch, within 60 days of completing the project. The report must include the location of the work, asbuilt drawings of the structure(s) and/or fill(s), and a discussion of the avoidance and minimization measures incorporated into the project and mitigation measures employed. h. Construction of temporary roads and temporary fills to facilitate the completion of any of the listed activities. Note: Maintenance of existing flood damaged structures and/or flood damaged fills, which have been previously authorized, may be authorized by Nationwide Permit No. 3 or exempted by Part 323.4 of Federal regulations 33 CFR 320-331. NWP 13 - Bank Stabilization. Broken concrete used as bank stabilization must be reasonably well graded, consisting of pieces varying in size from 20 pounds up to and including at least 150 pound pieces. Applicants must break all large slabs to conform to the well graded requirement. Generally, the maximum weight of any piece should not be more than 500 pounds. Gravel and dirt should not exceed 15% of the total fill volume. 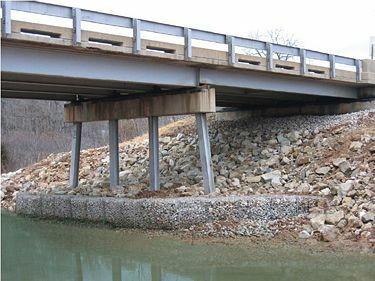 All protruding reinforcement rods, trash, asphalt, and other extraneous materials must be removed from the broken concrete prior to placement in waters of the United States. NWP 27 - Stream and Wetland Restoration Activities. The permittee must notify the COE District Engineer in accordance with the “Notification” general condition of the NWPs (general condition 27) for any regulated discharge associated with the relocation of forested wetlands. NWPs 3 and 14 - Low Water Crossings. The permittee must notify the COE District Engineer when repairing, rehabilitating or replacing low water crossings when discharges of dredged or fill material would raise or lower the lowest elevation of the crossing by a total of 12 in. or more, or when removing the structure. The permittee must propose and employ measures to mitigate the potential impact of impounding gravel above the low water crossing or of releasing impounded-gravel downstream of the structure. Such mitigation might include: removing impounded gravel in the unstable area upstream of the low water crossing to prevent it from being transported downstream and/or constructing a notched weir to slow the release of impounded gravel from upstream of the low water crossing. Suitable Material (Applicable to all NWPs). In addition to the specific examples in General Condition 6 of the NWPs, the following materials are not suitable for fill activities into waters of the U.S. in conjunction with any NWP: buses or rail cars, construction or demolition debris, garbage, loose or improperly placed tires, treated lumber (chromated copper arsenate (CCA), creosote, and pentachlorophenol), liquid concrete not poured into forms, grouted riprap, bagged cement, and sewage or organic waste. Culverts. 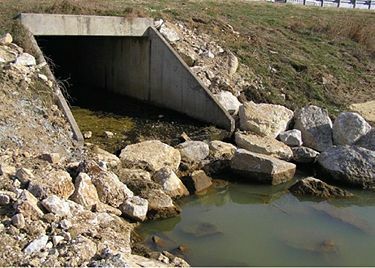 The permittee must notify the COE District Engineer in accordance with the “Notification” general condition of the NWPs (general condition 27) for any regulated activity which involves the construction of a new or replacement culvert with an inside width/diameter greater than 4 ft. All culverts must be designed to meet the criteria set forth in COE Regional Condition 1, allowing the natural passage of aquatic organisms. See EPG 750.7.3 Environmental Requirements for additional details. Notification Requirement for Aquatic Resources in Missouri (Applicable To All NWPs). The permittee must notify the COE District Engineer in accordance with the “Notification” general condition of the NWPs (general condition 27) for any regulated activity which may impact a jurisdictional fen, seep or bog of any size. Seasonal Restrictions for Activities Proposed in Spawning Areas (Applicable To All NWPs). In addition to the requirements of NWP general condition 3, for any regulated activity, the following specific seasonal restrictions apply. 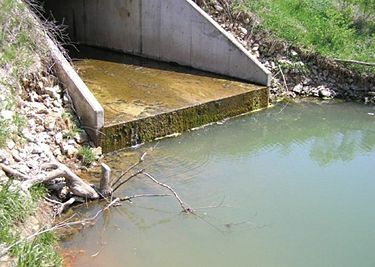 Between the closed dates listed in the Missouri Combined Stream Spawning List, the permittee must not excavate from or discharge into the listed waters. The list of waters with seasonal restrictions is available or on request from the Corps. Zebra Mussel (Applicable To All NWPs). The permittee must notify the COE District Engineer in accordance with the “Notification” general condition of the NWPs (general condition 27) for any regulated activity where the applicant is proposing to remove equipment from a known zebra mussel water to use in a different water not known to support zebra mussels. Known zebra mussel waters within Missouri is available on request from the Corps. The notification must include measures to limit the likelihood of spreading the zebra mussel to other waters. Priority Watersheds (Applicable To All NWPs). The permittee must notify the COE District Engineer in accordance with the “Notification” general condition of the NWPs (general condition 27) for any regulated activity in a priority watershed. The list of priority watersheds requiring notification is available on request from the Corps. Lake of the Ozarks. The permittee must notify the COE District Engineer in accordance with the “Notification” general condition of the NWPs (general condition 27) for any regulated activity associated with NWPs 3, 7, 12, 14, 15, 18, 22, 27, 33 and 45. A copy of this notification must also concurrently be sent to AmerenUE. NWPs 2, 13, 16, 19, 25, 29, 31, 35, 36, 39, 41 and 44 are revoked in the Lake of the Ozarks. NWPs 1, 9, 10, 11 and 28 are only valid when both AmerenUE and the Missouri Water Patrol have approved the activity. The Corps and AmerenUE, regardless of the request to use any NWP, may verify the activity under the provisions of Regional General Permit 38M. Additional information on AmerenUE and Lake of the Ozarks permit requirements is available. 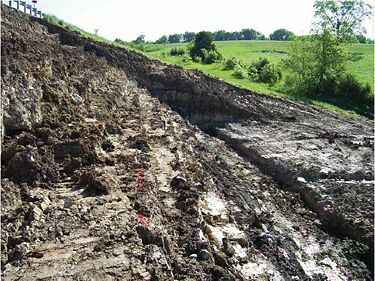 Erosion Control Best Practices, Organizational Results, July 2010. Highway Slope Maintenance and Slide Restoration Workshop Manual, FHWA December 1988. Land Disturbance Training, Design & Construction Divisions, 2010. This page was last modified on 6 March 2019, at 11:40.